Chinese Pancake for Crispy Duck and Spring Roll Pastry. We were audited and approved by the KLBD (Kashrut Division of the London Beth Din). Operating in over 60 countries, KLBD is one of the largest companies to approve kosher certifications and issue certificates. 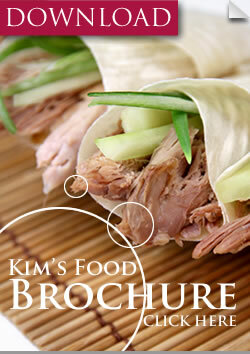 Here at Kim’s Food, we were under strict guidelines and were scrutinized very closely for any issues or problems that we may have. The Rabbi audited our factory closely, inspecting each of our rooms to ensure that both of our pastry products (Chinese Pancakes for Crispy Duck and Spring Roll Pastry) passed the Kosher Laws. Eventually, the Rabbi left and was satisfied that our products passed the Kosher standard for food. We were then very promptly awarded with a Kosher Certificate. We were delighted with the outcome and hopefully with this certification, we are looking forward to working with any enquires regarding kosher products.